Recently I have been working more with businesses that have been successful in the past but are needing to change their direction because their traditional offerings are not meeting the needs of the current markets. For some businesses particularly agribusiness, to change products can be extremely risky as well as requiring a huge investment of time and money. So how do you take the first steps to developing new products and services? The first step is to undertake research to make sure that whatever new product or service you are offering, has some demand and that there is a market willing to pay the price for it to be profitable for your business. Too often businesses come to me with an already developed product needing promotion to encourage sales. Promotion only works if the product for sale is something people want and is priced at a price they are prepared to pay. So it pays to do the research before developing the product. Before starting in a new direction make sure you know the answers to these questions. If you don’t get some help from a Marketing Consultant or conduct the research yourself. Is there a need for what you are wanting to produce or offer? Who will buy the product/service? How do you reach this group of customers? Why will they buy this product/service? How much are they prepared to buy this product/service for? What are the benefits for the customer e.g. save time, get a better, fresher product, less chemicals, unique product etc. What are the minimum quantities they require? How do they want to purchase from you e.g. online etc. What are the options for transport? Who else is offering this product or service? What are the differences between you and the competitors? Ailsa regularly presents on this topic check out her workshops. 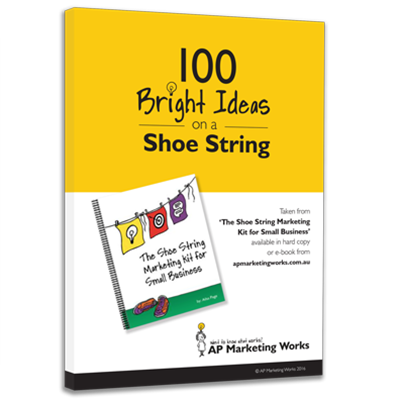 The Shoestring Marketing Kit for Small Business explains developing products and services in simple to understand language.